J2 PIN 9 IS UNCONNECTED. A. THE PRESENT TIME IS SET BY A RESISTOR (57.6K) AND CAPACITOR (3-3 MICROFARADS) AT APPROXIMATELY 200 MILLISECONDS. B. THE NEED TO ALTER THIS WILL BE DETERMINED BY THE SPEED AT WHICH YOUR TRANSCEIVER CAN SWITCH FROM RECEIVE TO TRANSMIT (AND COME UP TO FULL POWER). THE VANCOUVER BOARD WILL RAISE RTS AND THEN SEND DATA AS SOON AS IT GETS CTS IN RETURN, SO THE TRANSMITTER RF UNIT HAS TO BE READY TO GO AT CTS. SYNTHESIZED RIGS AND RIGS WITH RELAYS IN THEM (RATHER THAN SOLID STATE SWITCHING) WILL PROBABLY NEED A LONGER TIME DELAY. C. THE TIME VALUE IS EQUAL TO THE RESISTOR VALUE (IN OHMS) TIMES THE CAPACITOR VALUE (IN FARADS), DOUBLING THE CAPACITOR VALUE WILL DOUBLE THE TIME VALUE ETC. D. THE RESISTOR AND CAPACITOR ARE LOCATED JUST TO THE RIGHT OF THE M20 LABEL ETCHED ON THE PC BOARD (BOTTOM), THE RESISTOR IS JUST ABOVE M20 LABEL, THE CAPACITOR IS BELOW THE M20 LABEL (WATCH OUT THE RESISTOR IS CODED WITH A FOUR BAND COLOR CODE). HAVE FUN, IF YOU HAVE ANY PROBLEMS GIVE ME A CALL AT HOME 408/251-2910 IN THE EVENING. 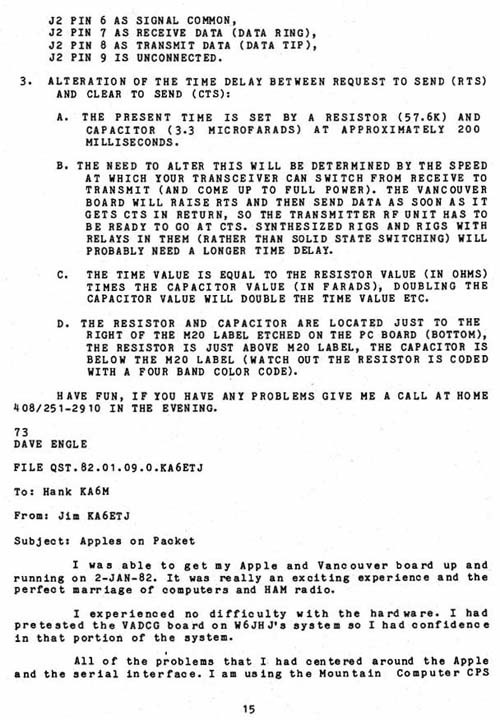 I was able to get my Apple and Vancouver board up and running on 2-JAN-82. It was really an exciting experience and the perfect marriage of computers and HAM radio. I experienced no difficulty with the hardware. I had pretested the VADCG board on W6JHJ's system so I had confidence in that portion of the system.